At the recent RTX event in Sydney, I was invited to go hands-on with a number of upcoming titles from Devolver Digital’s publishing stable. Playable on the show floor were Ruiner, Strafe, Shadow Warrior 2, and Absolver. 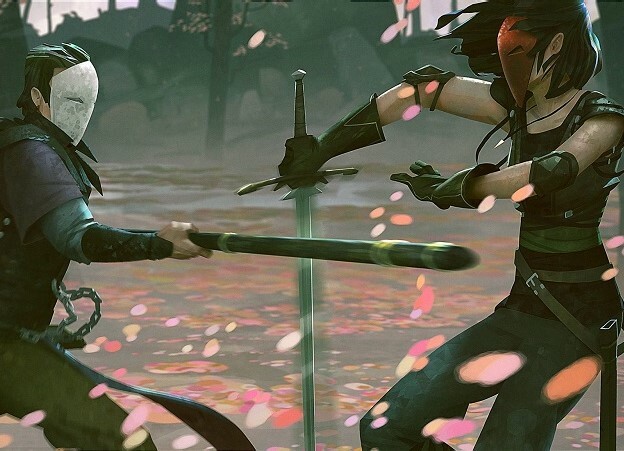 I was also lucky enough to have a chat with Absolver’s creative lead Pierre Tarno, on how the game came to be and where it was going. Ruiner’s conceit will be familiar to anyone who played the rather great Hotline Miami. 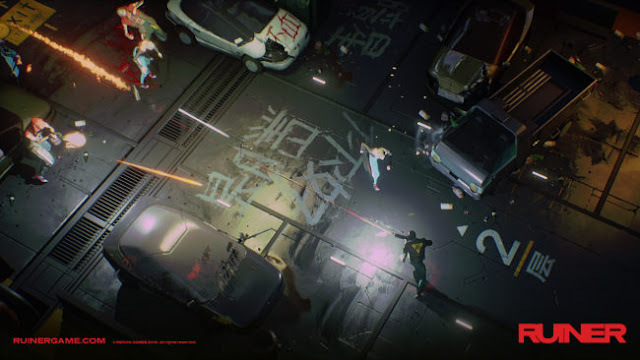 Positioned as a (very almost) top-down twin-stick shooter with a psychedelic sci-fi aesthetic, Ruiner does little new with the genre. But that’s not necessarily a bad thing. Even in such an early stage of development, Ruiner’s gameplay is noticeably polished. While the UI was a little confusing, after a slight teething period I was soon on my way to fluid baddie-massacring heaven. Literal heaven, it seemed, since the introductory stage placed me in a place called Heaven, tasking me to “Kill the Boss”. The game was not shy in reminding me of my goal, either, with nearly every monster closet ending in a digitized cut-in like a nasty 90’s hacker film scene with heavily modulated voice announcing KILL THE BOSS. The impression of the narrative I left with was that of a highly conspiratorial, unreliable narrator thriller, and it clicked well with the sci-fi look. Unlike Hotline Miami, Ruiner’s protagonist has a few tricks up his sleeve. One is a HP bar, meaning you can take a few hits before falling. There is also a dodge, allowing you to chain up to three rapid movements in slow motion to navigate the mostly claustrophobic corridors and simple boxy battle arenas. You’re also equipped with a shield, which lets you confront turret emplacements and enemies head-on. Despite having one fixed melee weapon, there were a number of different types of guns, like the default – and eponymous – Ruiner, which had time-recharging ammo, or explosive shotguns and rapid fire rifles. You could keep your melee weapon and carry a single projectile weapon at a time. Ruiner was fast, stylish, and quite often challenging, and it’ll be interesting to watch just how arcadey it will turn out. 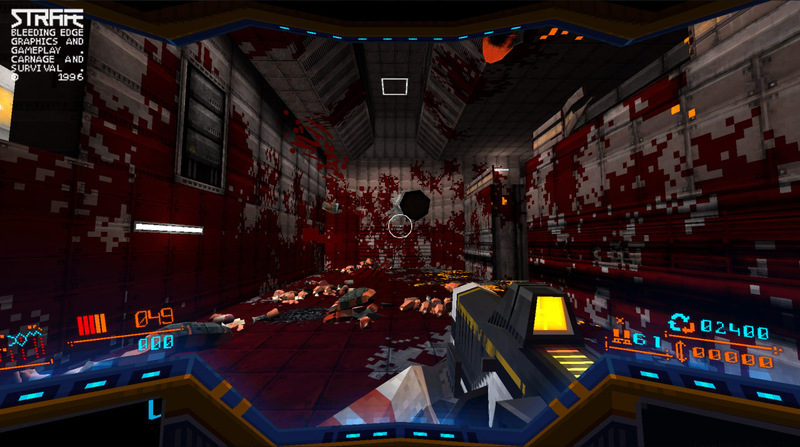 Strafe is straight up billed as Doom meets Quake. A fast-paced classic FPS in a low-poly 3D map, with hoards of swift critters thirsting for blood. And blood is a core theme here. Kills from your powerful arsenal leave satisfying splatters of the stuff all over the walls and floors. At the end of each level and upon death, one of the scoring criteria is just how many gallons of the good old crimson you managed to forcefully remove. I was reminded of Devil Daggers, with the focus on speed of murder and emphasis on circle-strafing, but with a Quake-style map and enemies. Each level is procedurally generated, meaning you’ll never play the exact same level twice, adding to variety but also making the levels a dizzying maze of samey corridors. I spent most of my time lost and confused, relying on the aforementioned blood splatters to navigate. It was only after I got my bearings that I realised how small each map is. Half a dozen medium-sized rooms, a few connecting corridors, one or two larger areas – all with similar wall textures and creatures. Moving to the next level involved finding a keycard and an exit door, and then moving on. There are secret areas and powerups, and a monster kill-count that are tallied at the end of a map, but since weapons, ammo, and health all carry over to the next level – and loading times are almost non-existent – it feels more like one large maze than a series of separate places. Each strafing run started with a choice of three weapons – a machine gun, shotgun, and rail gun – with more weapons being locatable in-game. I managed to find both a rocket and a grenade launcher, and many weapons also had an alternative firing mode to mix things up. Unlike Doom, you do have to reload, and the ammo UI is a little unwieldly to navigate, but it never really gets in the way. During the very first cutscene I was reassured to hear the signature “you got Wang” phone greeting of Shadow Warrior’s sophomorically named protagonist Lo Wang. Shadow Warrior 2 is Shadow Warrior, alright. In fact, I can safely say that Shadow Warrior 2 is Shadow Warrior But More. If you’ve played the series before, you’ll be familiar with the ridiculous sword-and-gun antics on offer here. 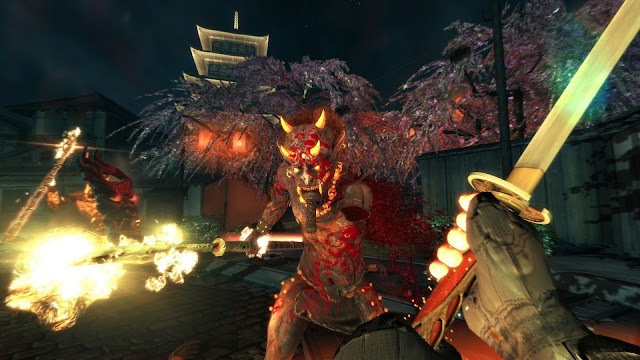 Playing as a modern day monster hunter armed with a gun and a sword, most of Shadow Warrior is spent navigating a standard 3D shooter map in standard first person view. There are health and ammo points, slightly hidden paths, a bit of climbing and double jumping, and a lot of things to hit with sharp metal things. Enemies take on a decidedly Japanese bent, fitting into the story’s modern ninja mythos. There’s humour, violence, ridiculousness, absurdism, and a traditional/untraditional Japanese backdrop. It’s sleek, fast, and occasionally just quiet enough to be pleasant, but most of all it’s a traditional shooter’s shooter. That’s not to be dismissive. I mean that in the most reverent way, because Absolver really feels like Dark Souls, without actually imitating Dark Souls like lesser “Souls-likes” do. It has a similar complex world, broken up by singular safe points that look like digital light fires. And, most importantly, it has heavy, weighty, deliberate, almost Saturnine combat. Oh that combat. I will be dreaming of that combat for a long time to come. One thing most people don’t know about me is that I have a black belt in Tae Kwon Do. I know how hand-to-hand-as-a-dance-sport works. I know how it’s supposed to feel. And Absolver captures that feeling perfectly. 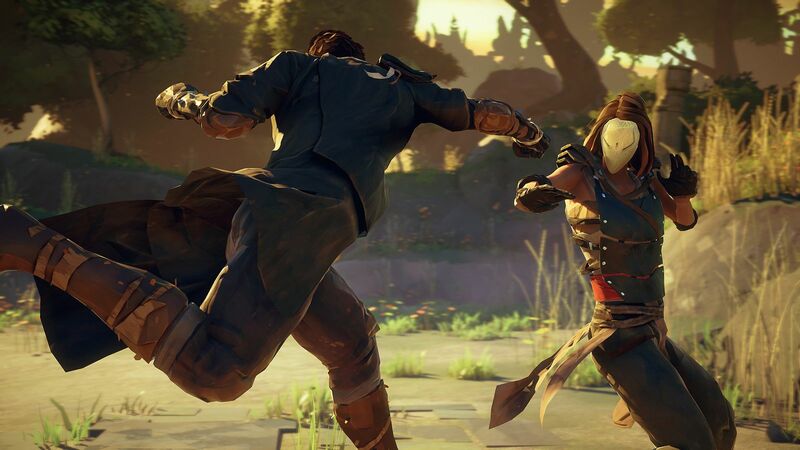 This isn’t by coincidence, either, since a number of team members behind Absolver are also martial arts trained, Tarno informed me. 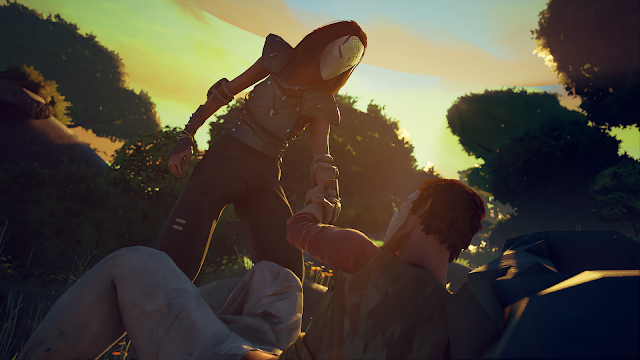 So Absolver sees you in a bright, fantastical, minimalist ruin of a world, following your slightly customised protagonist as they run through the elegant decay around them. It’s third person, positioning you the right distance behind your character for the many combat encounters you’ll face. And what combat! Most of what I played was unarmed melee combat; hand-to-hand elegant dance against those who would do the same to you. Input is simple – you have a heavy attack and a light attack, a block, a dodge, and a confusing reversal/regain system that I never quite worked out. But where it gets deep is with the stance changes. There are four stances you can adopt – front left, front right, back left, back right – and each of these stances has their own heavy and light attack. Not only that, but you can learn and discover new strikes, and customise which strike you’ll use in each stance. So two attacks (light and heavy) become eight attacks (a light and heavy for each of the four stances). Not only that, but certain attacks will change your stance. And attacks can be chained. And attacks consume a different amount of stamina. And if you hit the button at the right time your follow-up attack is faster or stronger. Every strike is powerful, and meaningful, and deliberate. It feels crunchy. It feels smooth. It feels realistic. It feels stylised. You feel like a granite statue made from lighter-than-air water dancing in a Yuen Woo-ping film. It’s one of the deepest combat systems I’ve experienced in a third person adventure game, and I love it. This means combat becomes a deliberate affair, carefully managing positioning and stance and stamina and damage output and defence and counters and, most of all, enemy mentality. But hang on, how do you manage enemy mentality, when the enemy is AI? Simple. Absolver is a multiplayer game at heart. That’s not to say the game isn’t single player focused – because it is. It has what appears to be an involved world and campaign. But you will be able to bring friends and foes alike along with you. This takes the form of visitors to your game. Other people will be able to enter your world and from then on help or hinder you in whatever way they choose. Friendly fire is always on, and multiplayer allies can turn into enemies at a whim. This isn’t pointless, though. Even if you end up on the opposite side as your former ally, you will still get something out of the experience. You can even learn new techniques that you haven’t found yet through PvP combat, or, as Tarno very eloquently put it, “if you get kicked in the face fifty times, you’ll eventually learn how to do that kick”. There will also be a “mentor” system, where another player can agree to help you train, and pass on combat techniques through that training. For those looking for a quick human on human fight, there will be dedicated PvP arenas. There is a basic system incorporating armour and weapons, but I wasn’t able to experiment much with that part of the game before I got my behind handed to me in PvP by one of the Devolver PR reps, who graciously let me win the first round of the three round bout, before thoroughly trouncing me in the second and third. There is an alpha test coming in the next few weeks, and release date is the amorphous “mid this year”. Tarno told me that they are still adding combat styles, an emote system, and more content.